Introduction Anhydrides are widely used as cross-linking agents in epoxy resins and alkyd production, for example, as coatings and adhesives in plastic products. Sensitisation to several anhydrides is known to cause occupational asthma. There are indications that the lesser known pyromellitic dianhydride (PMDA) can cause irritative respiratory symptoms and possibly asthma. We report three cases of workers from a plastic foil manufacturing plant, who developed asthma when exposed to PMDA during specific inhalation challenge (SIC). Methods SIC was performed over 2 days according to recommendations of European Respiratory Society. Lactose powder was used in control challenges and a mixture of 10% PMDA and 90% lactose powder in active challenges. Results All cases experienced a delayed decrease in forced expiratory flow in 1 s (FEV1) 4–12 hours after active challenge. FEV1 decreased by 19%, 15% and 16%, respectively. After 21 hours, FEV1 decreased by 24% in one worker. Discussion Respiratory symptoms after working hours may represent delayed work-related asthma. During SIC, the three patients developed lower respiratory symptoms and a delayed decrease in FEV1 which suggest sensitisation. The mechanism of anhydride-related asthma is not well understood. Anhydrides are known irritants and hence an irritative response cannot be excluded. The company improved ventilation and enforced the use of respiratory protection equipment, and finally phased out PMDA. Occupational workplace risk identification may help to identify exposures. SIC can contribute to improving working conditions, by identifying and confirming asthmogens in the environment. Pyromellitic dianhydride (PMDA) is one of several highly reactive acid anhydrides. Exposure to acid anhydrides is known to cause skin irritation, mucous reactions and asthma. We report three cases with persistent asthmatic symptoms associated with PMDA exposure. Specific inhalation challenge (SIC) suggests PMDA as an asthmogen in all three cases. SIC is considered the reference method for diagnosing asthma caused by low-molecular-weight substances. Clinicians diagnosing and treating patients with asthma should be aware of possible work exposure to PMDA. The present cases demonstrate the importance of considering asthma after work as possible delayed work-related asthma. SIC may be useful in confirming causal factors and improving the work environment associated with work-related asthma. Pyromellitic dianhydride (PMDA) is one of several highly reactive acid anhydrides and used extensively in the production of thermoplastics and high-performance coatings.1 2 Anhydrides including PMDA are respiratory irritants and immediate-type sensitisers.3 Some anhydrides have been associated with occupational asthma.1 3 4 PMDA has also been related to occupational asthma.1 3 5–8 This short report presents three cases where asthma due to PMDA exposure is suggested. Three workers in a plastic foil manufacturing plant were referred to the Department of Occupational Medicine due to work-related respiratory symptoms. Case A was a 52-year-old ex-smoking male maintenance worker with no previous respiratory symptoms. He had worked for 16 years at the plant. Case B was a 46-year-old non-smoking male operator, working for 4 years with control and monitoring of the extrusion process. He had no previous respiratory symptoms. Case C was a 46-year-old non-smoking male electrician, who had atopic dermatitis and hay fever as a child. He was employed for 24 years. PMDA had been used at the plant since 2008, to increase the viscosity of plastic food packaging products used in the food industry. Initially, PMDA powder was poured directly in a funnel from 10 kg bags. After a few years, the PMDA bags were opened and added in industrial glove boxes to reduce dust exposure. In 2014, the company introduced a new larger extruder, where PMDA was added in a semi-open dosing system several metres above the main working area. In the spring of 2015, local exhaust ventilation in the new extruder was closed for repairs. Three employees developed respiratory symptoms within a few months after the new extruder was introduced, particularly when changing filters and during reparations. Respiratory protective equipment was occasionally used during these work processes. Specific immunoglobulin (Ig) E to common aeroallergens and available anhydrides were measured using kits from ThermoFisher. SIC was performed according to the recommendations of the European Respiratory Society.10 Asthma treatment was carefully reduced before the challenge. SIC was performed in a 7 m3 challenge chamber at the outpatient asthma clinic, Odense University Hospital. Temperature, CO2, humidity, air exchange and dust particles (DustTrakR, TSI, Shoreview, Minnesota, USA) were monitored. Day 1: control challenge with lactose powder. Day 2: active challenge, with pouring 200 g powder (90% lactose and 10% PMDA) back and forth between two trays. Dust levels were between 0.8 and 3.0 mg/m3. The active challenge was followed by hospitalisation at the Pulmonary Department. FEV1 was registered frequently the first hour and every hour in the additional 10–14 hours thereafter. There were no PMDA air measurements from the workplace. Clinical characteristics of the three cases and their responses to SIC are summarised in table 1. Pre-SIC spirometry showed FEV1 of 88%, 69% and 106% of predicted values, respectively. Case A had positive specific IgE for three of the five anhydrides. The two other cases had elevated specific IgE for various common aeroallergens. 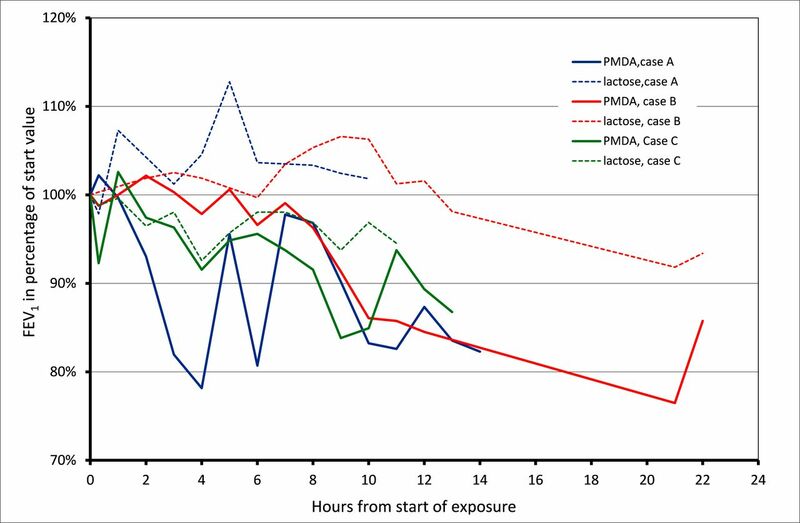 During PMDA challenge, FEV1 fell 19%, 15% and 16% after 6 to 12 hours (see figure 1). After 21 hours, FEV1 fell by 24% in case B. Termination of PMDA exposure at the plastic foil manufacturing plant resulted in symptoms reduction and in two cases significant improvement in lung function. Change of FEV1 in per cent of baseline values during control and PMDA challenge. FEV1, forced expiratory flow in 1 s; PMDA, pyromellitic dianhydride. The present results suggest that PMDA exposure may cause occupational asthma. Various anhydrides have been associated with asthma.1 2 4 11 PMDA has also been linked to rhinitis, haemorrhagic rhinitis and bronchial hyper-responsiveness.3 5–8 A limited number of PMDA-related asthma symptoms have been described. A Japanese group reported two possible cases of occupational asthma caused by PMDA.7 A study with workplace challenges demonstrated asthma in one worker after mixing epoxy and PMDA. It was unknown which component was asthmogentic.6 Two studies using airway resistance identified four cases of PMDA-related asthma.5 8 The more common fall in FEV1 was not used in these studies. The mechanisms of anhydride-related asthma are not well understood.12 Some individuals with asthma caused by anhydrides show specific IgE antibodies to anhydride–human serum albumin conjugates suggesting IgE mediation.8 11 12 Cross-reactivity among anhydrides has been shown.8 No commercial kits analysing specific IgE to PMDA are available. Only one of the three cases had positive specific IgE to the available anhydrides suggesting possible sensitisation. Thus, cross-reactivity with other anhydrides was not useful in these cases. During SIC, the three patients developed lower respiratory symptoms and delayed fall in FEV1 suggesting sensitisation. Anhydrides are also highly irritative.2–4 The absence of upper respiratory symptoms during SIC argues against an irritant reaction. Furthermore, the exposure levels during SIC were below the occupational exposure limit value for anhydrides in Denmark of 0.4 mg/m3 (Maleic anhydride). Thus, an irritative response is less likely. Finally, the delayed asthma resulted from the challenges, further suggest an immunological response. Due to these results the company expanded the use of respirators and improved ventilation. Finally, the use of PMDA was completely eliminated at the plant. Asthma symptoms were reduced in all three cases after PMDA was eliminated. Two had marked improvement with normalisation of lung function. Lung function was not improved in case B, suggesting that PMDA-associated asthma may be persistent. SIC is useful in diagnosing occupational asthma due to LMW agents. LMW-associated asthma is often delayed1 and can be identified by SIC. Thus, symptoms after work may be work-related. Correctly diagnosing work-related asthma can be very useful in improving work environments. Contributors DLS, LRS and JB: identified the cases. DLS, LRS, JB, ADN and MTM: managed the cases. DLS, LRS and JB: examined the cases. DLS: had the idea for the article. MTM, DS, LRS and JB: reported the work described in this article. DLS and LRS: are guarantors of this Short Report.